The Port of Houston, Texas with refineries in foreground. Photo by United States Coast Guard, PA2 James Dillard, Wikimedia Commons. Publicly traded U.S. oil exploration and production (E&P) companies annually assess their expected future cash flows from their proved reserves based on prevailing prices, technology, and geology. In addition to these primary factors, with the recent release of proved reserves assessments for 2017, U.S. E&P companies included effects associated with changes to corporate income tax law enacted at the end of 2017. The implications for the 2017 proved reserves reports include fewer tax liabilities for the companies than under the old tax law, ultimately contributing to the total increase in the future cash flow they expect from proved reserves. The federal corporate income tax rate was permanently reduced from 35% to 21%, effective January 1, 2018. Tax benefits from net operating losses generated starting January 1, 2018, can be applied to a maximum of only 80% of taxable income in any given year, without expiration. Previously, a company could use net operating losses to claim tax benefits on all of its taxable income, but only for up to 20 years in the future. A net operating loss is generated when operating expenses exceed revenues. The corporate alternative minimum tax was repealed. The TCJA limits interest expense deductibility to 30% of adjusted taxable income. Previously, companies could generally deduct all interest payments on debt. Capital investments may be completely expensed through 2023. After 2023, bonus depreciation can be expensed at lower rates until it is phased out to 0% in 2027. Previously, the accelerated depreciation of capital assets was set to expire by 2020. Fourth-quarter 2017 financial results reported by 46 U.S. E&P companies that EIA follows reveal an immediate effect from the tax reform. Collectively, these companies lost $991 million before taxes in the quarter, which would generate an income tax benefit at the prevailing rate. The collective tax benefit claimed in the fourth quarter of 2017, based in part on changes to future tax liabilities, was more than $7 billion, contributing to an annual effective tax rate for 2017 of -147% (Figure 1). Tax payments or benefits on the income statement do not necessarily reflect cash outflows or inflows, but rather a change in a given company’s assets and liabilities. 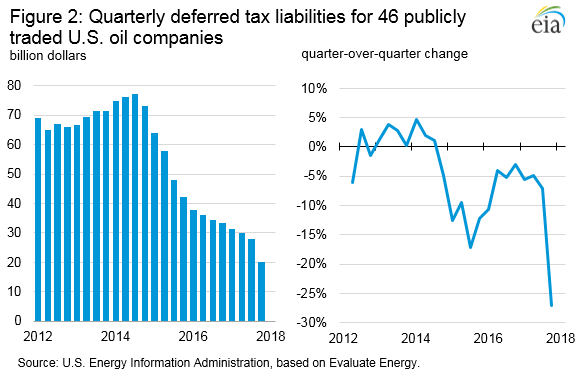 The large income tax benefits for these 46 E&P companies were attributable to a one-time reduction in their cumulative deferred tax liabilities, which are estimates of an amount of tax a company will eventually have to pay in the future. Deferred tax liabilities are generated for a given time period because of differences in how companies record transactions under generally accepted accounting principles (GAAP) and how much tax they owe in a given year. Because these companies had positive net income—that is, operating revenues greater than operating expenses—from 2012 to 2014, their deferred tax liabilities generally remained flat or increased slightly in these years. 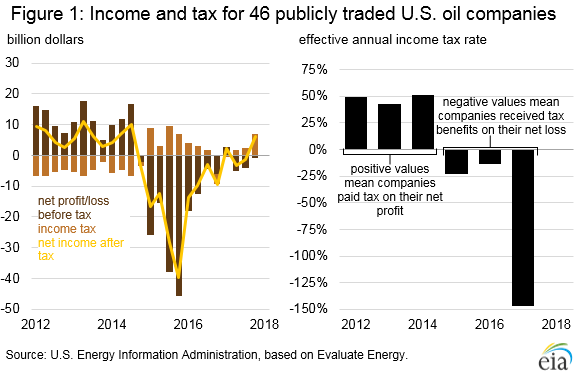 After significant declines in oil prices in late 2014, the companies generated large net operating losses from 2015 to 2016, allowing them to claim income tax benefits and reduce their deferred tax liabilities (Figure 2). The 27% decline in deferred tax liabilities in the fourth quarter of 2017 was attributable to revaluing these liabilities at the lower corporate income tax rate. Most companies cited the reduction of their future expected tax expense from the new corporate tax rate as a factor contributing to the increase in expected future cash flows from proved reserves. Every publicly traded oil company must follow a standardized measure for valuing their proved reserves and estimating their future cash flows, based on guidelines from the U.S. Securities and Exchange Commission (SEC). The largest drivers of changes in the estimated cash flows from a company’s proved reserves are the estimated quantities of crude oil and natural gas it can produce in the future based on its current investments, and the prices of these commodities, but changes in income tax rates also play a significant role. 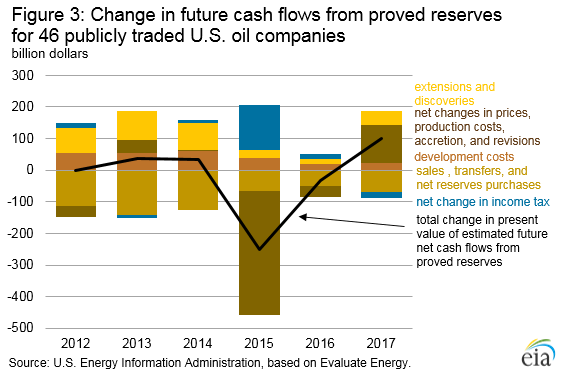 The net present value—an estimate of future net cash flows in today’s dollars from oil and natural gas production after costs and taxes—of the companies’ proved reserves increased by $100 billion from 2016 to 2017, the largest annual increase during the 2012–to–2017 timeframe (Figure 3). Income taxes are just one factor among many that affect oil company investment decisions and cash flow from operations. First-quarter 2018 financial statements, which will be released in May, will represent the first period that may demonstrate some of the ongoing effects of the changes in tax law. The U.S. average regular gasoline retail price rose 5 cents from the previous week to $2.70 per gallon on April 2, 2018, up 34 cents from the same time last year. Rocky Mountain prices increased over seven cents to $2.60 per gallon, East Coast prices increased nearly six cents to $2.65 per gallon, West Coast prices increased over five cents to $3.33 per gallon, Midwest prices increased five cents to $2.57 per gallon, and Gulf Coast prices increased nearly five cents to $2.43 per gallon. The U.S. average diesel fuel price rose over 3 cents to $3.04 per gallon on April 2, 2018, 49 cents higher than a year ago. Rocky Mountain prices rose over five cents to $3.04 per gallon, West Coast prices rose nearly five cents to $3.49 per gallon, and East Coast, Midwest, and Gulf Coast prices each rose nearly three cents to $3.07 per gallon, $2.96 per gallon, and $2.85 per gallon, respectively. U.S. propane/propylene stocks increased by 0.6 million barrels last week to 36.2 million barrels as of March 30, 2018, 9.4 million barrels (20.5%) lower than the five-year average inventory level for this same time of year. Gulf Coast and Rocky Mountain/West Coast inventories increased by 0.7 million barrels and 0.1 million barrels, respectively, while Midwest inventories decreased by 0.2 million barrels and East Coast inventories dipped slightly, remaining virtually unchanged. Propylene non-fuel-use inventories represented 7.8% of total propane/propylene inventories.